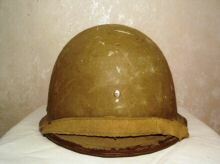 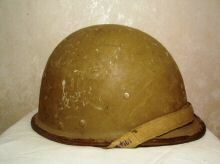 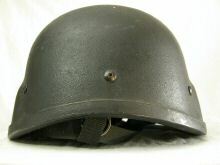 A Fiberglass helmet, a copy of Israeli, Chinese and South Korean helmets. 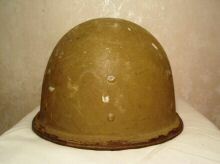 "It is made from fiberglass so I suppose it is a composite helmet of sorts. 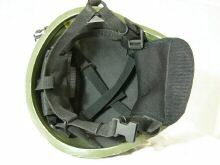 The interior features a nylon suspension liner and is lined with green plastic. 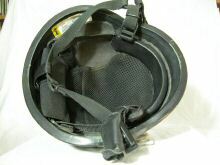 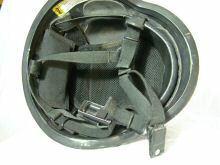 A neck flap is attached to the liner and features a buckle chinstrap along with a set of ear flaps. 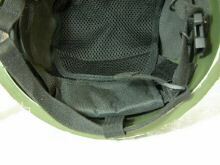 The masking tape around the outside edge is there to cover the liner stitching, as this is sewn directly to the helmet shell." 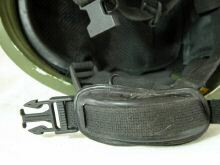 They claim to have widespread international sales. 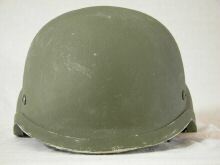 Neither this model nor the one following are shown on their current website and may be considered obsolete models no longer in production. 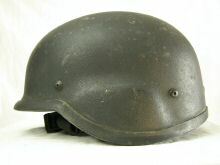 MKU - specific model unknown. 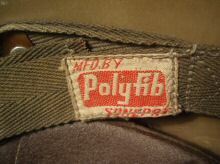 dated 2008. 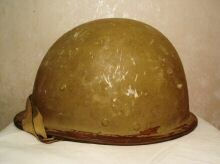 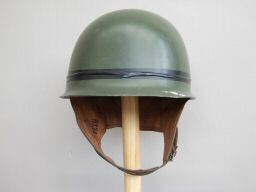 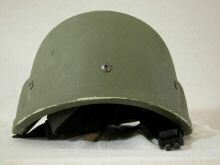 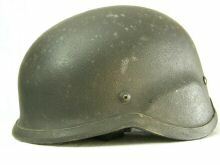 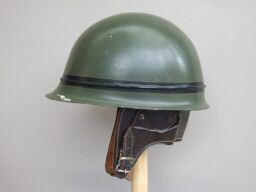 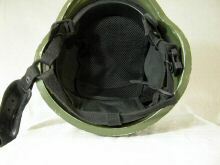 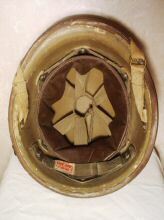 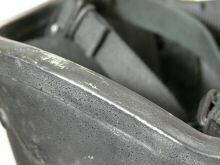 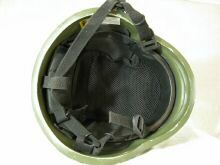 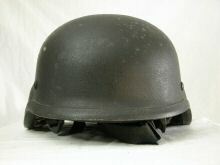 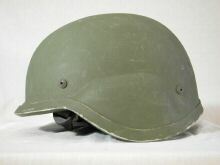 This helmet is similar to the MKU shown immediately above - the shell and liner may be identical. 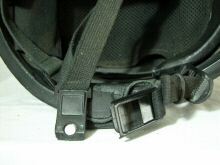 The essential difference may simply be the chinstrap. 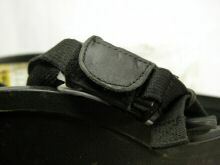 The liner is the same construction as the model above, most elements being held together with velcro. 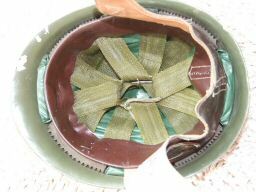 The net liner can be peeled open as shown in the previous entry. 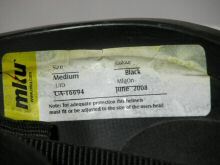 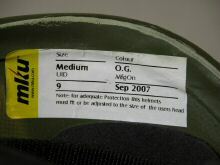 This model is tagged as 'Black' on the label, but this abrasion mark indicates it may actually be a black paint over a green moulding. 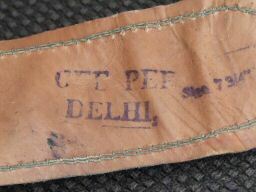 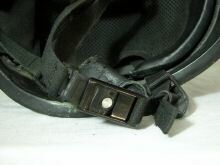 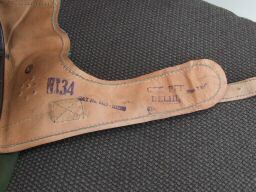 The chinstrap clip has an unusual leather covering, probably essential for comfort as it lies on the cheek of the wearer. 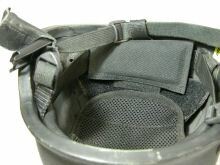 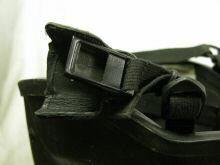 The cover is held closed with velcro strips (see three photographs above). 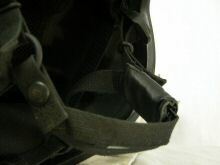 The catch is not at all easy to release without undoing the leather cover first. 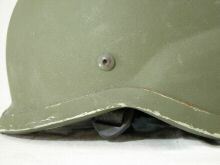 This may be a design flaw.